Our wide range of astrological products would help you correct the energies in your life. The products are prescribed according to the type of challenges you are facing in life. Some of these are to be kept in the meditation alter with formal procedures and others are to be worn. 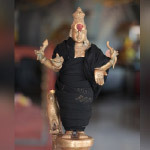 Our list of products, which includes statues, Yantras, Malas and incense sticks etc, are designed and crafted to bring a quality improvement within you and the atmosphere around you. While shipping the products to you, we will be sending you the instructions about how to benefit from the product. The Ganesha Yantra is a sacred energy device that infuses within you the power to focus and accomplish your goals. The radiations from the Yantra will enhance your positive spirits and stimulate your confidence level to succeed in all your efforts. 'Luck' is an element of positivity that drives in success, happiness and prosperity into your life. The bracing breeze of luck brings about volumes of money, comforts and gains when you make it blow in your direction—Dhanakarshana Yantra does it for you! This Yantra showers on you the blessings of Goddess Lakshmi, an embodiment of wealth and prosperity. She bestows upon you material comforts and good luck. Conquer your enemies now! Break the clutches of all your unexplainable sufferings and worries. The supreme guard Lord Vishnu encircles you with energetic vibrations that relieve you from mental stress, fear, health ailments and, other obstacles. Saraswati is the creative angel who transforms imagination into reality. She is the one who paints your life with creative thoughts and artistic colors! Creativity is one of the qualities that make you an outstanding performer. When your innovative thinking is powered by knowledge, you will become ‘Jack of All Arts’! Draw the circle of protection around you — seek the blessings of Lord Vishnu to flourish, maintain good health and achieve success in all your endeavors. The Yantra will bless you with a winning personal and professional life as well. It will encourage your efforts and amplify the happy elements of your life. Let Maha Vishnu encircle you with happiness, peace and success in your life! Are you lagging behind in confidence and wisdom? Possess the Subramanya Yantra to boost your confidence level and to power up your intelligence. Subramanya (Lord Muruga) is an embodiment of confidence and knowledge; he stimulates your confidence level and gifts you with success in all your endeavors. His Yantra comes handy to you for empowering and enhancing your confidence and wisdom. Your life becomes easier when you captivate people around you. When you are magnetized with attraction, they yearn to help you and even go out of their way even before you could even ask! Develop a strong circle of magnetism that pulls people towards you. Your charm, communication and other soft skills play a vital role in determining your personality that will attract people around you. Mark an end to all your sufferings and health ailments now! Lord Hanuman, the Guardian Deity will guard you against all dangers and strengthen you with courage and knowledge. His unflinching energy will power up your life line and stimulate your inner spirits. Hanuman will protect you from the malefic effects of Saturn if Saturn is unstably placed in your Birth Chart. Are you stumbling to balance your time? Your efforts and initiatives to complete your assignments on time might go in a vain; but not when the Kalabhairava Yantra finds its place in your living space. Multitasking is the order of the day; it demands your persistent will power and hard work to stick on to your time. Kalabhairava Yantra will sharpen your time management skills and bless you with success! Happiness, peace and success will always be important needs of your life -- you may require a dynamic force behind you to achieve these elements in your life. Parvati is the Shakti who empowers you with positive energy to fulfill your responsibilities on the earth plane. She is the divine feminine energy who acts behind the entire Universe. When Shakti finds her abode in your place, you will be gifted with everlasting inner peace, positivity, happiness, health, wealth and prosperity! Your spiritual interests are the windows to the eternal world; only when your spiritual desires are fulfilled, you will be able to live your life peacefully and happily. Gayatri Yantra represents the Goddess Gayatri; it identifies your power points and alleviates your spiritual interests and desires, as well. Let the moonlight soothe your mind and emotions! Your mental confusion or emotional slips may be a reason for downfall in your life. Your Moon takes charge over your mental and emotional balance. A disturbance in your mental or emotional life can result from a weak placement of Moon in your Birth Chart. The Moon Yantra is the solvent that can dissolve those disturbances in your life! Harness the boundless divine energy to generate positivity in and around you. When you awaken the spirits of divinity in you, you will sense the heavenly harmony creeping into your mind and soul! This is a continuous process in which the harmony enhances your power of thinking, and in turn you leave a dynamic impact on your living space. Here, Jupiter Yantra is your mediator! Go after the life you want and get it Take life you have and improve it Take any circumstance that is in-and make it work for you Imagine how much your life would improve if you can fall under one of the above categories ... All this is possible only through the use of Ketu (South Node of the Moon) Yantra. Melt the trauma and problems with the use of this unique talisman! Rahu Yantra can steer you clear of materialism and set you on the path to true riches. Imagine the power of being able to view anything – regardless of time, regardless of space. Imagine being able to achieve your aims for the past, present or future, from anywhere, anytime… using only the Rahu Yantra. Venus Yantra is a very powerful geometric pattern of energy that revamps your life style. It helps you attract the essential riches of life, the most yearned love, peace and honorable respect.